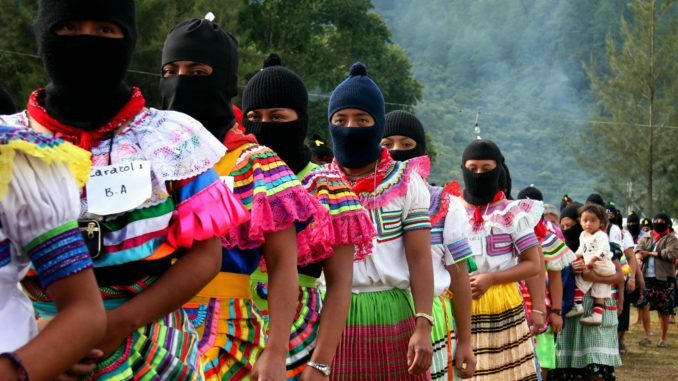 We as Zapatista women send you our greetings as the women in struggle that we all are. We have sad news for you today, which is that we are not going to be able to hold the Second International Encounter of Women in Struggle here in Zapatista territory in March of 2019. Maybe you already know the reasons why, but if not, we’re going to tell you a little about them here. The new bad governments have said clearly that they are going to carry forward the megaprojects of the big capitalists, including their Mayan Train, their plan for the Tehuantepec Isthmus, and their massive commercial tree farms. They have also said that they’ll allow the mining companies to come in, as well as agribusiness. On top of that, their agrarian plan is wholly oriented toward destroying us as originary peoples by converting our lands into commodities and thus picking up what Carlos Salinas de Gortari started but couldn’t finish because we stopped him with our uprising. All of these are projects of destruction, no matter how they try to disguise them with lies, no matter how many times they multiply their 30 million votes. The truth is that they are coming for everything now, coming full force against the originary peoples, their communities, lands, mountains, rivers, animals, plants, even their rocks. And they are not just going to try to destroy us Zapatista women, but all indigenous women—and all men for that matter, but here we’re talking as and about women. In their plans our lands will no longer be for us but for the tourists and their big hotels and fancy restaurants and all of the businesses that make it possible for the tourists to have these luxuries. They want to turn our lands into plantations for the production of lumber, fruit, and water, and into mines to extract gold, silver, uranium, and all of the minerals the capitalists are after. They want to turn us into their peons, into servants who sell our dignity for a few coins every month. Those capitalists and the new bad governments who obey them think that what we want is money. They don’t understand that what we want is freedom, that even the little that we have achieved has been through our struggle, without any attention, without photos and interviews, without books or referendum or polls, and without votes, museums, or lies. They don’t understand that what they call “progress” is a lie, that they can’t even provide safety for all of the women who continue to be beaten, raped, and murdered in their worlds, be they progressive or reactionary worlds. How many women have been murdered in those progressive or reactionary worlds while you have been reading these words, compañera, sister? Maybe you already know this but we’ll tell you clearly here that in Zapatista territory, not a single woman has been murdered for many years. Imagine, and they call us backward, ignorant, and insignificant. Maybe we don’t know which feminism is the best one, maybe we don’t say “cuerpa” [a feminization of “cuerpo,” or body] or however it is you change words around, maybe we don’t know what “gender equity” is or any of those other things with too many letters to count. 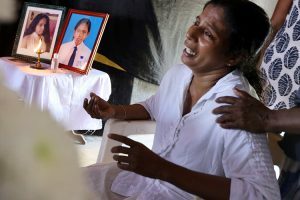 In any case that concept of “gender equity” isn’t even well-formulated because it only refers to women and men, and even we, supposedly ignorant and backward, know that there are those who are neither men nor women and who we call “others” [otroas] but who call themselves whatever they feel like. It hasn’t been easy for them to earn the right to be what they are without having to hide because they are mocked, persecuted, abused, and murdered. Why should they be obligated to be men or women, to choose one side or the other? If they don’t want to choose then they shouldn’t be disrespected in that choice. How are we going to complain that we aren’t respected as women if we don’t respect these people? Maybe we think this way because we are just talking about what we have seen in other worlds and we don’t know a lot about these things. What we do know is that we fought for our freedom and now we have to fight to defend it so that the painful history that our grandmothers suffered is not relived by our daughters and granddaughters. We have to struggle so that we don’t repeat history and return to a world where we only cook food and bear children, only to see them grow up into humiliation, disrespect, and death. We didn’t rise up in arms to return to the same thing. We haven’t been resisting for 25 years in order to end up serving tourists, bosses, and overseers. We will not stop training ourselves to work in the fields of education, health, culture, and media; we will not stop being autonomous authorities in order to become hotel and restaurant employees, serving strangers for a few pesos. It doesn’t even matter if it’s a few pesos or a lot of pesos, what matters is that our dignity has no price. Because that’s what they want, compañera, sister, that we become slaves in our own lands, accepting a few handouts in exchange for letting them destroy the community. When you came to these mountains for the 2018 gathering, we saw that you looked at us with respect, maybe even admiration. Not everyone showed that respect—we know that some only came to criticize us and look down on us. But that doesn’t matter—the world is big and full of different kinds of thinking and there are those who understand that not all of us can do the same thing and those who don’t. We can respect that difference, compañera, sister, because that’s not what the gathering was for, to see who would give us good reviews or bad reviews. It was to meet and understand each other as women who struggle. Likewise, we do not want you to look at us now with pity or shame, as if we were servants taking orders delivered more or less politely or harshly, or as if we were vendors with whom to haggle over the price of artisanship or fruit and vegetables or whatever. Haggling is what capitalist women do, though of course when they go to the mall they don’t haggle over the price; they pay whatever the capitalist asks in full and what’s more, they do so happily. No compañera, sister. We’re going to fight with all our strength and everything we’ve got against these mega-projects. If these lands are conquered, it will be upon the blood of Zapatista women. That is what we have decided and that is what we intend to do. It seems that these new bad governments think that since we’re women, we’re going to promptly lower our gaze and obey the boss and his new overseers. They think what we’re looking for is a good boss and a good wage. That’s not what we’re looking for. What we want is freedom, a freedom nobody can give us because we have to win it ourselves through struggle, with our own blood. Do you think that when the new bad government’s forces—its paramilitaries, its national guard—come for us we are going to receive them with respect, gratitude, and happiness? Hell no. We will meet them with our struggle and then we’ll see if they learn that Zapatista women don’t give in, give up, or sell out. Last year during the women’s gathering we made a great effort to assure that you, compañera and sister, were happy and safe and joyful. We have, nevertheless, a sizable pile of complaints that you left with us: that the boards [that you slept on] were hard, that you didn’t like the food, that meals were expensive, that this or that should or shouldn’t have been this way or that way. But later we’ll tell you more about our work in preparing the gathering and about the criticisms we received. What we want to tell you now is that even with all the complaints and criticisms, you were safe here: there were no bad men or even good men looking at you or judging you. It was all women here, you can attest to that. Well now it’s not safe anymore, because capitalism is coming for us, for everything, and at any price. This assault is now possible because those in power feel that many people support them and will applaud them no matter what barbarities they carry out. What they’re going to do is attack us and then check the polls to see if their ratings are still up, again and again until we have been annihilated. Even as we write this letter, the paramilitary attacks have begun. They are the same groups as always—first they were associated with the PRI, then the PAN, then the PRD, then the PVEM, and now with MORENA. So we are writing to tell you, compañera, sister, that we are not going to hold a women’s gathering here, but you should do so in your lands, according to your times and ways. And although we won’t attend, we will be thinking about you. Don’t stop struggling. Even if the bad capitalists and their new bad governments get their way and annihilate us, you must keep struggling in your world. That’s what we agreed in the gathering: that we would all struggle so that no woman in any corner of the world would be scared to be a woman. Compañera, sister: your corner of the world is your corner in which to struggle, just like our struggle is here in Zapatista territory. The new bad governments think that they will defeat us easily, that there are very few of us and that nobody from any other world supports us. But that’s not the case, compañera, sister, because even if there is only one of us left, she’s going to fight to defend our freedom. We aren’t scared, compañera, sister. If we weren’t scared 25 years ago when nobody even knew we existed, we certainly aren’t going to be scared now that you have seen us—however you saw us, good or bad, but you saw us. Take care of that little light that we gave you. Don’t let it go out. Even if our light here is extinguished by our blood, even if other lights go out in other places, take care of yours because even when times are difficult, we have to keep being what we are, and what we are is women who struggle. That’s all we wanted to say, compañera, sister. In summary, we’re not going to hold a women’s gathering here; we’re not going to participate. If you hold a gathering in your world and anyone asks you where the Zapatistas are, and why didn’t they come, tell them the truth: tell them that the Zapatista women are fighting in their corner of the world for their freedom. That’s all, compañeras, sisters, take care of yourselves. Maybe we won’t see each other again. Maybe they’ll tell you not to bother thinking about the Zapatistas anymore because they no longer exist. Maybe they’ll tell you that there aren’t any more Zapatistas.